A wrong tyre choice cost Andrea Dovizioso a chance to fight for back-to-back MotoGP victories at the Red Bull Ring. The Italian who won in Austria twelve months ago started from the middle of the front row. After losing the lead early to Marquez, the Italian couldn’t get past Lorenzo, instead using up his rear tyre behind his team-mate. “I couldn’t put myself in the right position,” said Dovizioso. “Marc started was very fast to make a good lap time, can stay there with the same pace but at the end maybe the tyre choice wasn’t the best one but also I couldn’t overtake Jorge. I used maybe too much the rear tyre to try to overtake Jorge and I couldn’t overtake him. “I was faster in that part of the race but I couldn’t rear prepare in the best way the overtaking and that cost me, because I had to slow down too early. I did a small mistake but already I was in trouble on the right side of the rear tyre. “I’m very disappointed because I had a chance to bring more points to our championship. But at the end when you make just two practices in the dry, this can happen. This means we didn’t make the right decision, but sometimes we are good and sometimes we are not perfect, and when you don’t make the perfect decision is good because you can learn for the next round – this is the something we did from last year and it’s worked. Dovi went on a different strategy from his team-mate electing for a medium rear tyre rather than the soft of his team mate. 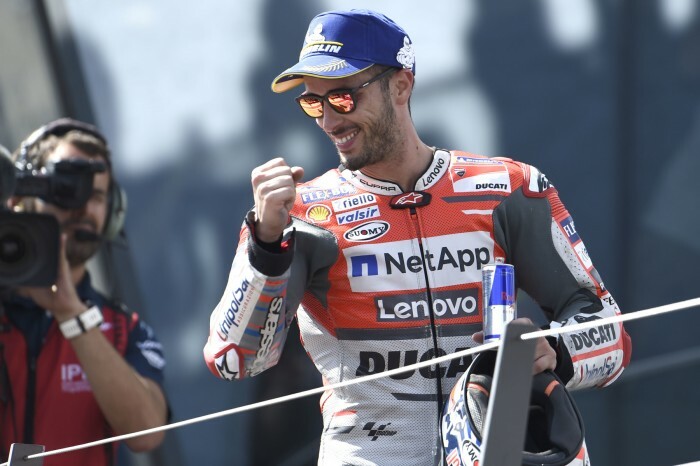 Dovi used the soft tyre in 2016 when he was beaten to the victory by his them team-mate Andrea Iannone. Despite that, Dovi admitted it didn’t play a factor in his tyre choice today. “It wasn’t easy to make the right decision, we did a good qualifying with the medium,” he said.